Mother's Day falls on March 26th this year. While mothers, all around the world, deserve appreciation every single day of the year; you can use the occasion of Mother's Day to show your mum how much you appreciate and love her. Here is a round up of 10 lovely gifts that you can get your mum along with some flowers. A selection of pulse point rollers from Indigo Herbs would make a well-received gift. Based in Glastonbury, Somerset, Indigo Herbs are passionate about natural health and sell a lovely range of natural health products of the best quality and at affordable prices. I have tried some of their pulse point rollers and am impressed with the quality. All their pulse point rollers use pure, unadulterated and hand crafted aromatherapy oil blends and come in 10ml roller size. The Destress & Unwind roller (10ml, £4.49) is a stress busting oil blend that is perfect for reviving the body/mind from tension. With essential oils of Basil, Geranium, Peppermint and Grapefruit, this blend has a very soothing effect. The Emotional Balance (10ml, £4.49) roller has a fresh and sweet and aroma and is a pulse point oil blend for times of emotional upset. With essential oils of Fennel, Geranium, Lavender and Bergamot, this blend has a very calming effect. The Intimate Bliss for Women roller (10ml, £4.49), as the name suggests, is a sensual aromatherapy oil blend for women. Pure essential oils of Ylang ylang, Bergamot, Fennel & Myrtle in 3% dilution of Sweet Almond oil & Peach kernel oil make this a very aphrodisiac blend. The fragrance is a mix of flowery, citrus and sweet notes. An interesting gift in the round up is this awesome adult jigsaw puzzle from Jumbo Games who are a puzzle manufacturer with a huge adult puzzle portfolio. The Wasgij Original 23: The Bake Off! 1,000 Piece Jigsaw Puzzle (£12.99) is as unique as it is entertaining. It is unlike traditional puzzles in the sense that you need to piece together the puzzle using your imagination, based on the scene printed on the box. The puzzle will really make you think! It is fun, it is challenging and you can get the whole family involved. If your mum loves jigsaws then Wasgij puzzles are perfect gift ideas! Is your mum partial to port and a chocolate lover? Then Graham’s Six Grapes and Rococo Dark Chocolate Bee Bar might be the perfect treat for her. Leading port producer Graham’s have teamed up with luxury chocolatier Rococo Chocolates to pair their fantastic range of Ports with different flavours of chocolate and one such perfect pairing is Graham’s full-bodied wine - Six Grapes, which has been paired with Rococo's 65% Cocoa Organic Dark Chocolate - Bee Bar. The chocolate bar is intense and absolutely delicious washed down with a little glass of the exceptionally full bodied and superbly rich Six Grapes Port. Port available from TheDrinkShop.com and chocolate from Rococo Chocolates. - White Tea Blueberry & Elderflower: An antioxidant rich, delicate White Tea, created with real juicy blueberries, aromatic elderflower and notes of zesty Lemongrass. - Lemongrass, Ginger & Citrus: With notes of Lemongrass and citrus infused with a tingle of ginger will refresh any palate. - Harrington Premium Single Origin Black Tea: Deliciously smooth single garden tea, sourced from the beautiful mountain ranges in Sri Lanka. - Super Berries: A delightful blend of classical herbs and aromatic berries. - Oolong Tea: A luxurious and intriguing tea with a delicate and soft flavour. I love these teas. Delicious, wrapped individually for freshness and beautifully presented in a tin packaging. it is a wonderful collection of teas that I am sure all tea lovers will enjoy. Buy from: Amazon. Have you heard of Tudor Times Shop? 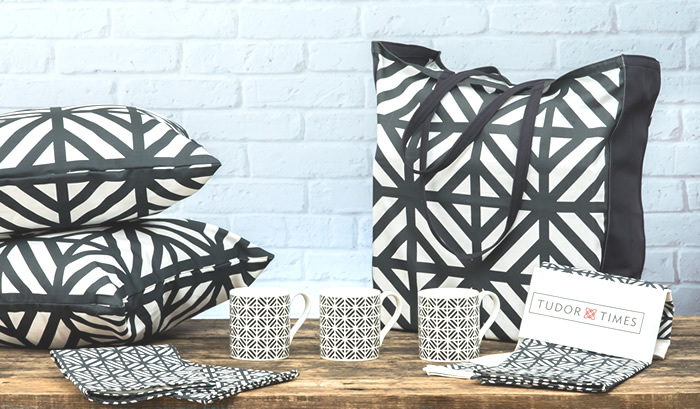 Inspired by the architecture and design of the Tudor, Stewart and Jacobean period, Tudor Times Shop stock a range of products like tea towels, cushions, mugs, tote bags, books and jigsaws to name a few. The products are categorised into three main ranges - Architecture, Knot Garden and Quotes. The Architecture range with its bold monochromatic shapes and patterns takes inspiration from the famous Tudor buildings that we all know. With beautiful and strong, geometric designs the Architecture range would make a stunning addition to any home. There are three different designs - Parr, Neville and Cavendish - in the range and the products include Tote Bags, Ceramic Mugs and Premium Tea Towels.